Every now and then, we hear how bad wedding photographers disappointed about-to-wed couples. After the wedding day, there’s really nothing you can do with bad printed pictures, since no one throws another wedding just to have better pictures (than their last wedding). If you’ve not yet chosen a photographer, there is something you can do to avoid becoming a victim – scroll down to read and follow our 10 tips for finding a photographer that won’t disappoint, PLUS our advice on what to do if after your wedding, you found you have bad pictures. In a previous article, (here) I told you the ‘wedding photography fail’ story from a wedding I attended a few months ago where the couple have still not received a single printed copy of their wedding photos. In that article, I also told you about a newlywed whose photographer delivered massively bad pictures they are ashamed to show people. In this post, you will get our 10 tips to avoid making mistakes when choosing your own wedding photographer. Read on. Don’t believe what a vendor tells you. Just because someone walks around hanging a camera does not mean he knows how to use it well. Just because someone showed you professionally photographed pictures does not mean he was the one that snapped them. Just because someone referred you to ‘their photography website or Instagram’ does not mean that they are the ones that snapped the pictures you saw – did you read their Instagram comments and saw some sort of testimonials from the people in the pictures? Did you hear from anyone who has used them before? Don’t plan to pay too-cheap for a wedding photographer – the good ones don’t come cheap. Instead, cut down cost from one wedding area to make up the cost of a GOOD PHOTOGRAPHER. Examples of where to cut costs are: number of guests to invite (so that you can lower the cost of food/ drinks, venue), outfits etc. Decide early on to make GOOD PHOTOGRAPHY a priority, not just about having wedding pictures. Plan and decide to have GOOD WEDDING PICTURES. Decide that you will hire a good photographer. Decide upfront that ‘CHEAP’ will not be the reason for you to hire ‘just anyone’ as your wedding photographer. Be true to yourself in what you can afford. Don’t plan to have both a videographer and a photographer IF you have a small budget and all you can afford is only a photographer. *If you have GOOD WEDDING PICTURES, you can make them into a slideshow video, and that will be nice – instead of horrible or low quality pictures and low quality video. Be sure that your photographer will come with a second shooter/ assistant. If not, arrange for someone else to also snap photos – just in case your main photographer fails to capture some important shots. Some guests may have snapped much better photos of you and your hubby – JUST ASK: After the wedding, contact your family and friends via whatsapp, email or social media, and beg them to share any nice random photos they took at your wedding – who knows, come may be better than what your photographer sent you. 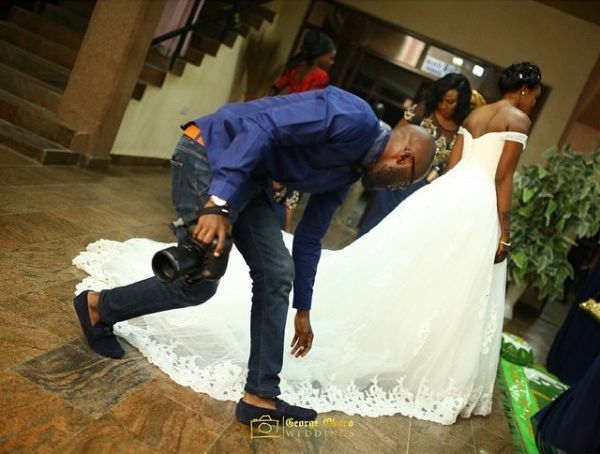 Hey brides (and grooms), we are tired of hearing about wedding photographers disappointing couples, and we want to help reduce or stop this from happening to Nigerian brides. That’s why we wrote you the above tips and advice to follow when choosing your wedding photographer. Hopefully you can avoid the mistake most brides make when choosing a photographer. We love featuring weddings with good snapshots on this blog and on our Instagram page, and I want your wedding to be next. Thanks for reading; I hope you’ve found our wedding photography tips helpful. Leave us a comment or additional tip down below, in the comment area. One of my major wedding budget is photography and Videography. I just can’t imagine having to live with a bad memory or poorly captured memory of one of the important days of my life that only happens once. Thanks for this article. You’re welcome Florence. I’m happy to know that you’ve decided to give photography and video-coverage top priority at your wedding. Thanks for your feedback, dear. These are some great tips, and I appreciate your suggestion to plan on paying more for a wedding photographer. My fiance and I are going to be getting married at the end of this fall, and pictures are really important to me, so we want to find a great photographer. We’ll definitely allot more of our budget for that so we can get quality work. Thanks for the great post!